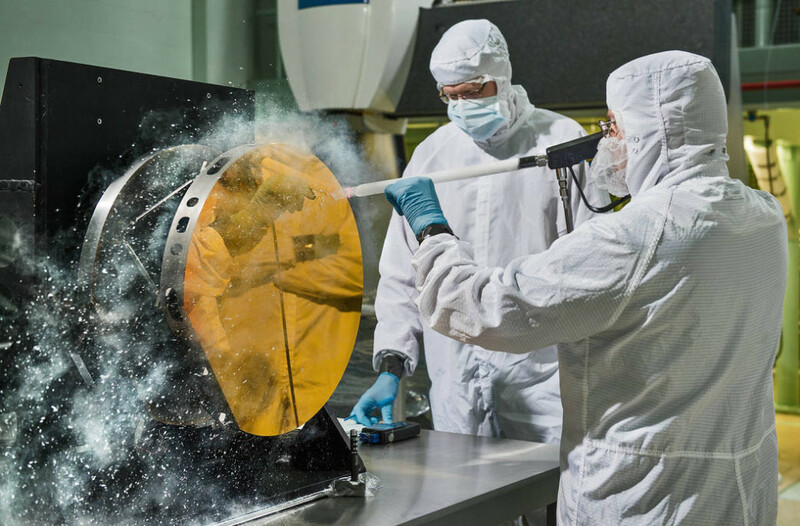 May 11, 2015 – Just like drivers sometimes use snow to clean their car mirrors in winter, two Exelis Inc. engineers are practicing “snow cleaning'” on a test telescope mirror for the James Webb Space Telescope at NASA’s Goddard Space Flight Center in Greenbelt, Maryland. By shooting carbon dioxide snow at the surface, engineers are able to clean large telescope mirrors without scratching them. “The snow-like crystals (carbon dioxide snow) knock contaminate particulates and molecules off the mirror,” said Lee Feinberg, NASA optical telescope element manager. This technique will only be used if the James Webb Space Telescope’s mirror is contaminated during integration and testing. The Webb telescope is the scientific successor to NASA’s Hubble Space Telescope. It will be the most powerful space telescope ever built. With a mirror seven times as large as Hubble’s and infrared capability, Webb will be capturing light from 13.5 billion light years away. To do this, its mirror must be kept super clean. Webb is an international project led by NASA with its partners, the European Space Agency and the Canadian Space Agency. The Near Infrared Camera (NIRCam) instrument for the James Webb Space Telescope (JWST) is being developed by Lockheed Martin, under contract with the University of Arizona. NIRCam is the primary science camera on JWST, and also functions as the sensor that is used to align the observatory’s primary mirror, built by Ball Aerospace. JWST will see farther into the cosmos and further back in time than any other telescope.